Walnut, a hard wood, is grown in Canada and the USA. The color ranges from light brown, dark chocolate, to a yellowish brown. 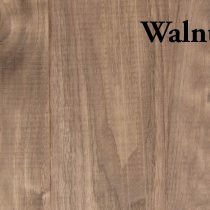 Walnut is used by gun makers for gunstocks and butts. It is a popular wood for cabinet and furniture making. Walnut is also used for carving and musical instruments. S4S means this hardwood has been surfaced on all four sides. This board has a cleaner appearance than S2S1E. Available in 4/4, 5/4, or 8/4 thickness, 1-1/2″, 3-1/2″, 4-1/2″ or 5-1/2″ wide, and 3′ to 5′ long.